The starting point for this outfit came from this luxurious, blue cotton velvet. 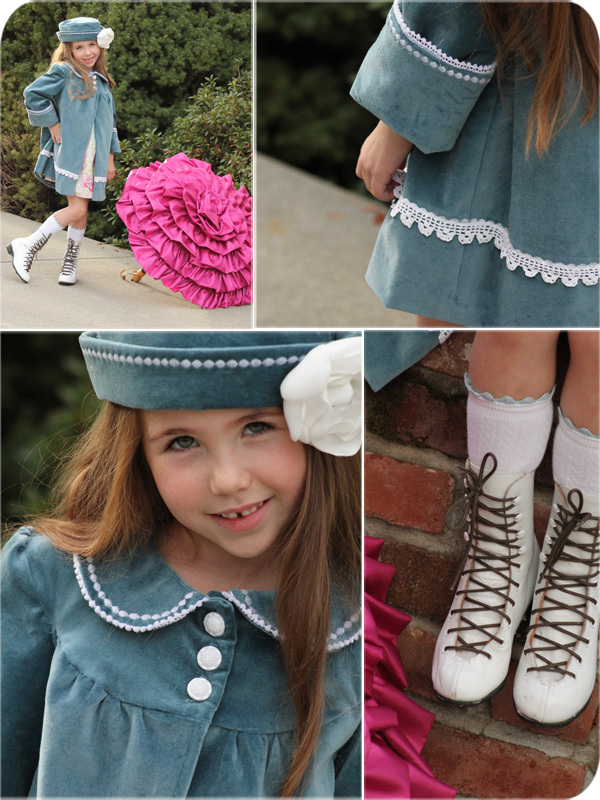 Its softness, both in texture and color, called for a classy, feminine look for a sweet, little girl. 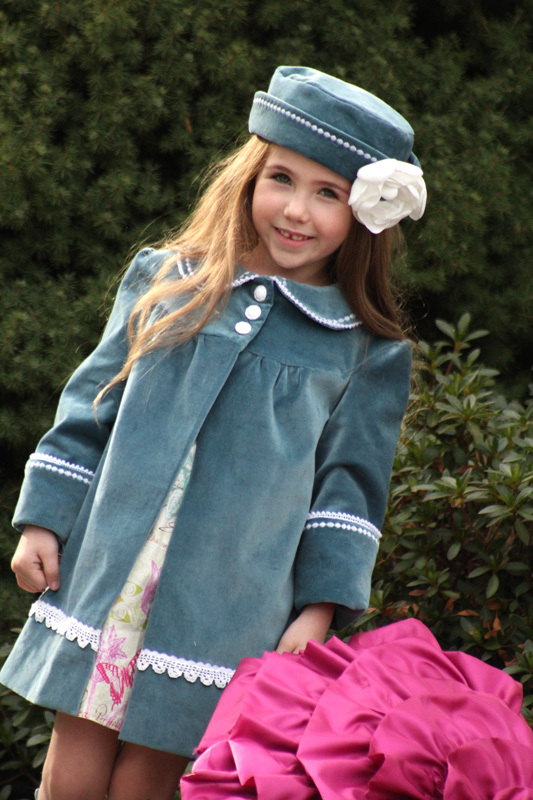 A dressy coat, pillbox-style hat, coordinating dress, lace-up boots, and fancy umbrella are the perfect ensemble for a stroll to Sunday school or a brisk day out on the town. I constructed the pattern for the coat piece by piece, sewing test garments first, since I had enough of the velvet to make only one coat and one hat - there was no room for error. The coat hits above the knee for a dressy, yet childish look, with a three-button closure. The yoke on the front and back is curved and the main panels of the coat are slightly gathered on either side of the center front and on the sleeves; the back panel has a single pleat. The coat is fully lined in a brightly colored, patterned cotton, which also coordinates with the dress underneath. The sleeves have a wide, upturned cuff on which I added white, beaded machine-embroidery and trim detailing. The beaded embroidery and trims also adorn the peter pan collar and the base of the coat. The embroidery is repeated once again on the brim of the flipped pillbox hat. A removeable, handmade satin flower with a velvet-covered button decorate the hat. As the coat came together, I knew that the look would be complete with lace-up boots, so I made a sprint into a thrift store to see what I could find. I couldn't believe my luck when I came across a very worn pair of ice skates. I removed the skates form the bottom, gave them a good scrub, a few coats of white spray paint and satin lacquer, and a new set of laces. The boots were paired with white knee-highs to which I added a blue ric rac trim. Finally, I cut strips of pink nylon, ruffled them and applied them to a thrift store umbrella. A most gorgeous accessory! And functional, too! Head over to my blog, girl. Inspired., for more on this outfit! Thank you! I am almost always foremost inspired by color. These colors-- shades of Plum and Robin's Egg, are repeated throughout my house and my closet and in the case of the later, my children's eyes. They feel harmonious and just make me happy. This coat makes me happy too. It's made of soft tissue weight linen, that I dyed to get the perfect shade. Then I quilted it with cotton batting and lined it with super soft shot cotton containing hints of the same hue. I started with a basic raglan pattern (I used one from Carefree Clothes for Girls...but just know that I changed absolutely everything about it if you are looking to recreate this...) changed several of the lines and proportions and drafted a separate yoke, which I inserted in a lovely cotton from Anna Maria Horner...one of my very favorite fabric designers. I love how cozy and natural and handmade this coat looks and feels. But mostly I love that girl (who posed in the rain!) in it. For more about how I put this coat together: www.mysparkle.blogspot.com. 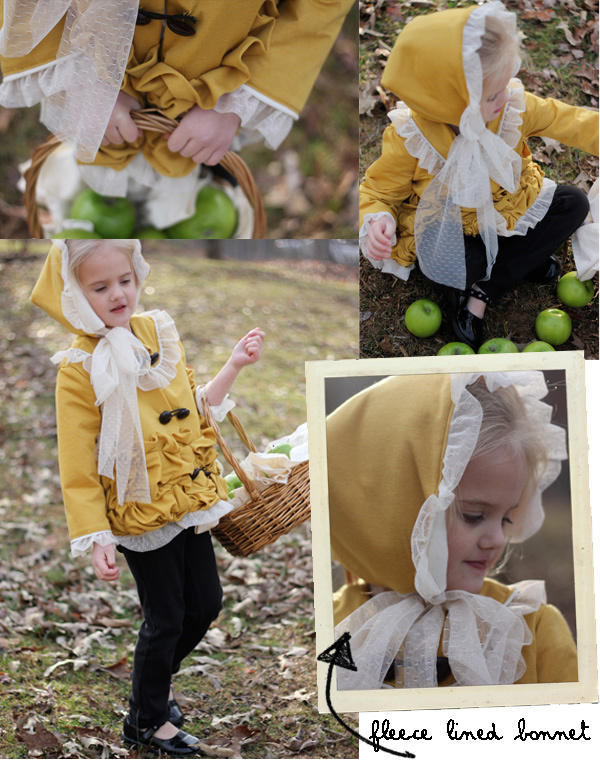 For the outerwear challenge I created a fairy tale inspired mustard yellow swing coat and matching bonnet, both heavily infused with ruffles. I used a yellow knit with a little sheen to it, which makes the coat cozy and soft and pretty! I used a vintage inspired lace and white cotton to accent the coat. The swing coat has so many little details, starting with billowy smashed ruffles topped with pleats that adorn the front and back of the coat. White piping peeks out from a layer of ruffles on both the sleeve cuffs and the collar. The inside is fully lined with screenprinted arrows! I printed the negative space around the arrows by hand with a silkscreen and black ink to give the inside of the coat interest and an extra woodsy-feel. The coat is closed with 3 rows of vintage buttons and black elastic. A ruffle adorns the bottom. The swingy shape allows tilts back and forth with play for a cute little movement. 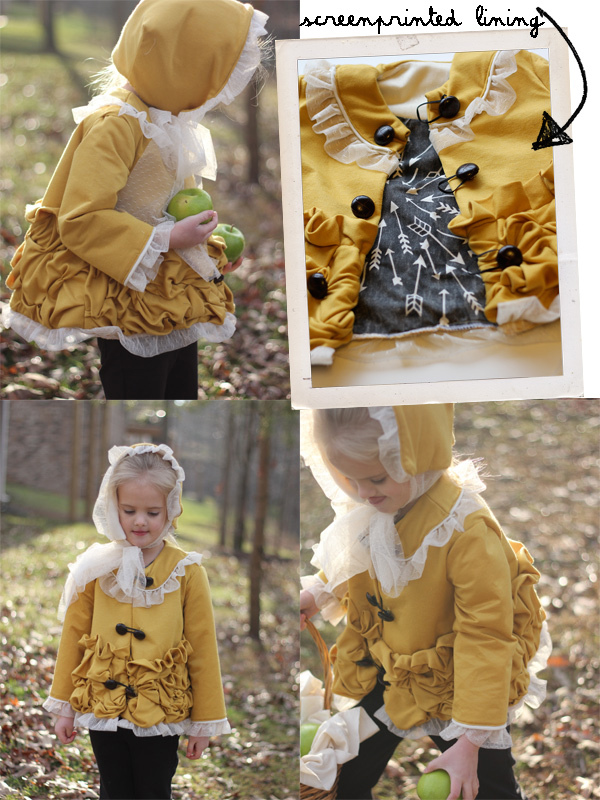 The ruffle bonnet is squared in the back and is fully lined with fleece to keep little ears warm! It ties under the neck with a lace bow and frames the face in lace ruffles. A perfect outfit for a day of apple picking(or running away from wolves)! Come over to see kate sew to see lots more pictures! I love this challenge! Originally I'd been thinking about something for my daughter, but had zero inspiration and ended up getting excited about an outdoor boy look that's unique, easy to wear, and full of pockets. Perfect for the monster pilot in every boy. 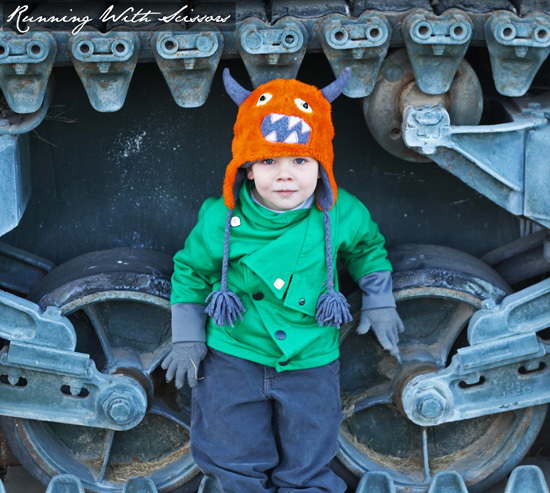 This jacket is military inspired, thus we took our pictures in front of a WWII tank. 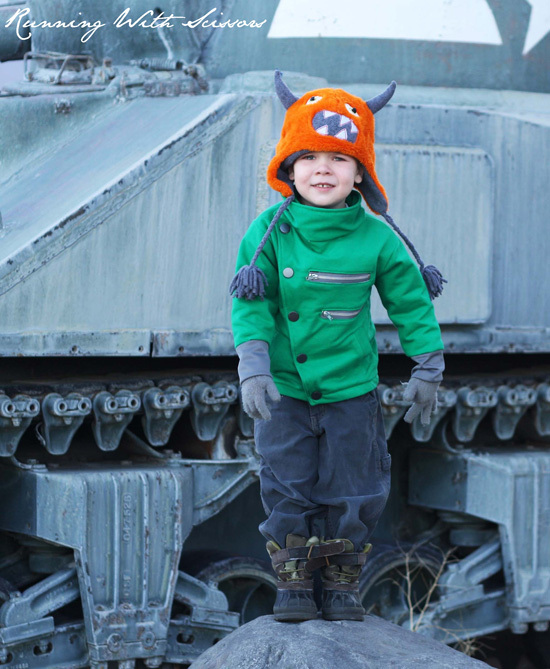 I paired it with army boots and a monster hat I made last winter. This coat is really me as far as the design goes. I love asymmetric construction, pockets, zippers, and unique necklines. The jacket construction is basically like a double breasted coat, with the top half being cut on the angle. There are 4 pockets in this jacket, the two welt pockets at the waist, and two zippered chest pockets. I chose to sew exposed zippers to make it seem more masculine with the metallic teeth accenting the chest. 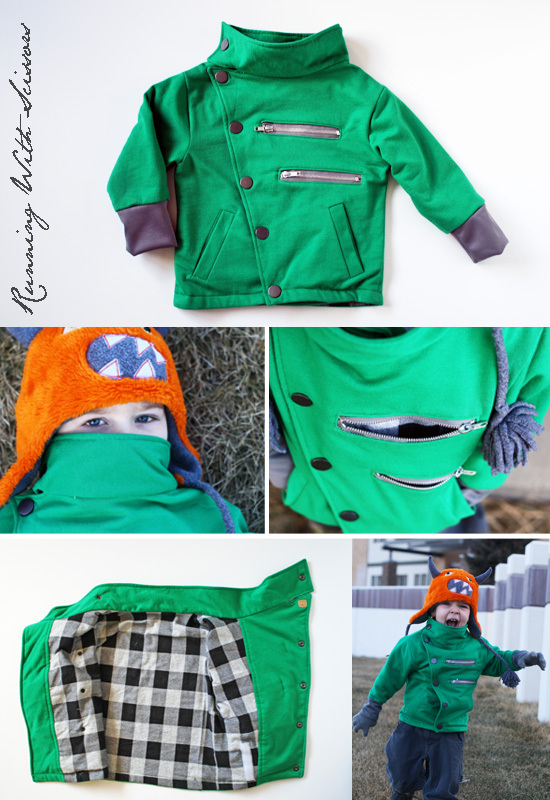 This would be really great in wool, but I'm realistic and would never put a kid in a dry clean only coat, so I went with sweatshirt fleece that is easy to take care of and more comfortable to wear. For closure, I used six large Anorak snaps in slate, and to tie all the gray accents together I chose to sew extra long charcoal cuffs. The jacket is fully lined with black buffalo plaid flannel, along with the chest pockets. I usually lean toward hoods, but I went with the standing collar which also acts as a scarf and really makes this jacket unique. You can also wear it with the collar open as shown below. Hop over to my blog for more photos and info on the hat! I'm starting to feel ready for springtime and wanted to make an outerwear look that was fun, unique, and something that my daughter would love to wear. 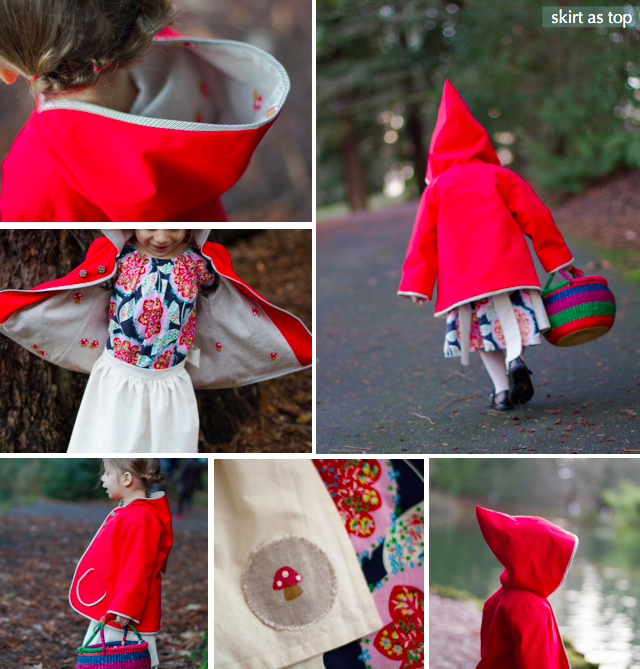 I pondered a bunch of different ideas until, one day, I was suddenly inspired to make a Little Red Riding Hood COAT! 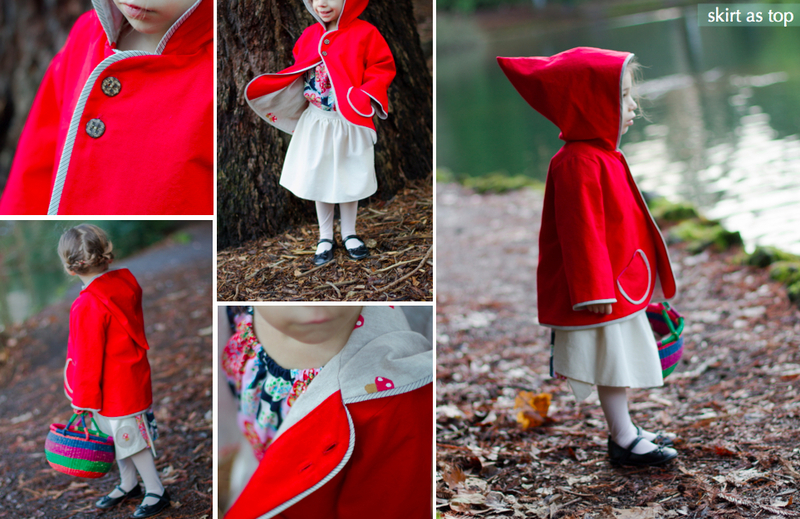 Little Red Riding Hood capes have a longstanding history but I'd never seen a Red Riding Hood coat before, so I was excited to design one. I wanted it to allude to the shape of a cape while still remaining practical for everyday running and playing, so I created a hip-length a-line swing coat with slightly flared sleeves. To add whimsy to the design, I drafted an oversized, pointy, fairy tale hood. The hood is my daughter's favorite part of the coat - she loves it! The outer material and facings are a sturdy but soft red canvas, and I lined the coat with a natural cotton-linen blend, which I hand-stamped with little red woodland toadstools in a three-step process. When you can't find the perfect fabric, it's so fun to print your own! The coat itself has rounded edges and round-bottom patch pockets, and is a bit longer in the back than in the front. I added flat piping around all edges of the coat, including the hood, hems of the sleeves, and the pockets, in a bias cut ticking stripe fabric. 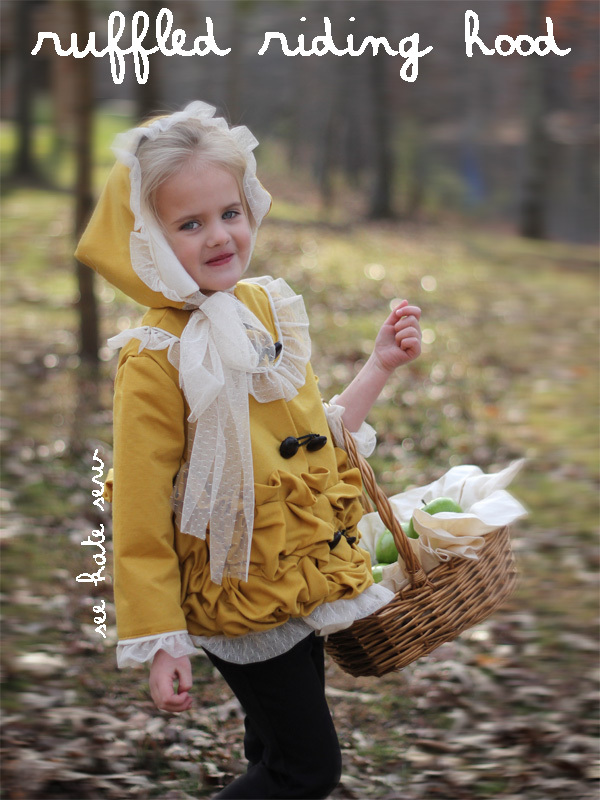 The coat closes with two "woven basket" buttons, just like the basket Little Red Riding Hood carries to grandma's house! To complete the Little Red Riding Hood look, I made a simple peasant dress in a beautiful Amy Butler floral print, and a muslin apron with a little toadstool patch ties over the dress. My daughter got very excited about dressing up and heading to the park with bread in her basket to feed the ducks in her little red coat. The ducks went a tad crazy and came way too close, and one large duck actually bit me as I tried to shoo it away! I guess the "big bad wolf" is actually the "big bad duck" in our story! Come visit me at skirt as top today for my initial sketch, more about the little details, and many more photos of my Little Red! They are all so different!! So many great and different examples of outerwear! Voting is going to be hard this week. once again wow! and I loved the two takes on little red riding hood! So many great designs! Love that favorite things coat! I KNOW this was a lot of work but it looks so simple and effortless---what a talent. It's so clean looking and well made. I just love it. You ladies are so so professional not only in your sewing but also your photography - you've all gone the extra mile! once again, I can't make up my mind. too much craftsmanship. too much cuteness! you women do make it look easy- especially as moms! The designs were all amazing- so this week I was forced to be extra picky about craftmanship. I don't know how you all do it... but really truly superb work! When I vote a box appears with the comment ''Poll doesn't recognise nonce'',was my vote counted? Its getting harder and harder to choose!! They are all so great. great job ladies!!! they are all so great. 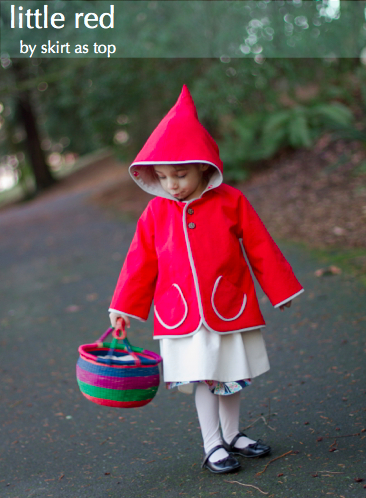 i was torn between the little red riding coat and the bomber... so wonderful. how long ahead of time do you know you are sewing? there is NO WAY (is there???) that you make all this in one week!!! I don't think the poll results seem skewed by popularity anyway. I did vote for one - but I could have voted for them all. They are all wonderful and so inspiring. Just when I thought they couldn't get cutier.. they did.. you guys so inspire me.... I could vote for them all... Great work done by all... I was so happy to see a boy one... as they are so hard for me to sew for....I am just in awesome.. Good Luck all..
i love danielle's coat! especially all the attention to subtle details. this is something i would actually dress my girl in in real day to day life. it's beautiful.